Next week we will be launching a new paper “The role of women as drivers of change in the energy transition” at an event at the House of Lords in the run up to International Women’s Day. The paper brings together articles from some of the inspiring women leading the transformation of our energy system. The key message of the paper is a simple one, summed up by Juliet Davenport “We need to do everything we can to encourage diversity in clean energy, for the simple reason that we’re not going to tackle a problem as big as climate change with only half of the population along for the ride.” The launch of the paper marks a step up in our EWiRE network of women working in clean energy and Rachel (rhayes@regen.co.uk) would be keen to chat to companies interested in working with us on this important initiative. The paper follows the launch this week of our work with SSEN on regional future energy scenarios and our response to Ofgem’s Targeted Charging Review. The breadth of this work reflects a key Regen principle – to accelerate the transformation of our energy system we need to combine detailed analysis with a recognition that change is about people, as much as technology. Regen and the Electricity Storage Network (ESN) responded to the recent consultation from Ofgem on the Targeted Charging Review. This review outlines how Ofgem plan to reform the distribution of residual network charges. Domestic buildings contribute 14% of UK GHG emissions annually and to meet our legally binding targets, this contribution needs to fall to virtually zero by 2050 – a mere thirty years off on the horizon. 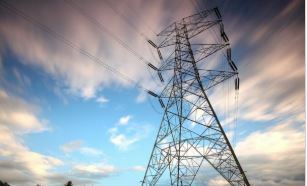 The latest of Regen’s distribution future energy scenarios (DFES) was launched by Scottish and Southern Electricity Networks (SSEN) at a webinar on 15 February 2019 with Poppy Maltby. Entrepreneurial Women in Renewable Energy (EWiRE) is launching a new paper looking at the role of women leading the way in the energy transition. It will be launched at the House of Lords on 5 March. 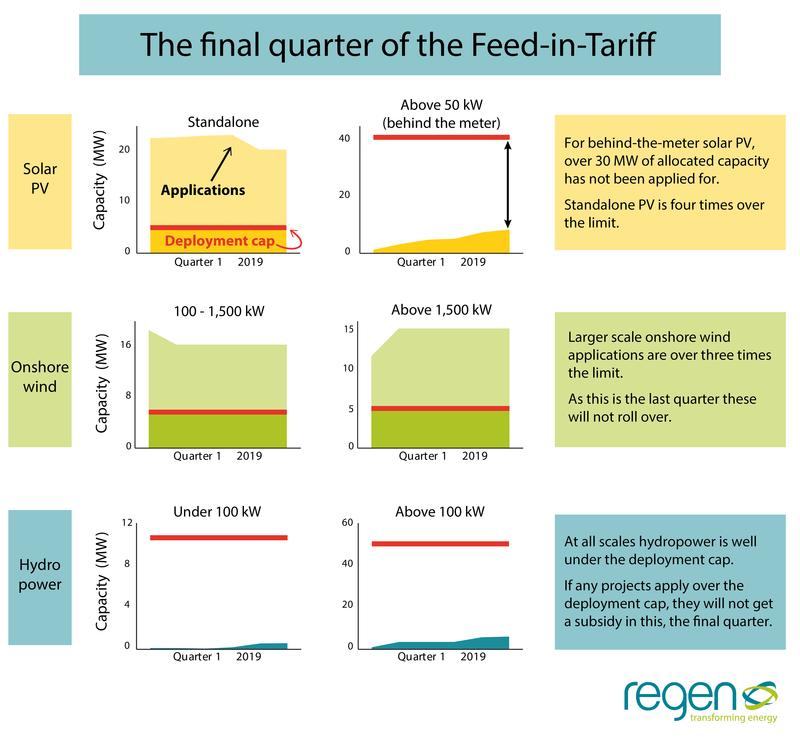 As the last month of the Feed In Tariff (FIT) scheme approaches, analysis shows there to be some 36 MW of wind and standalone solar projects, that have applied to the FIT scheme, but will receive no subsidy support. This is due to a feature of the scheme that enforces quarterly capacity deployment ceilings. So, with Q1 2019 being the last ever quarter of the FIT scheme, any projects that apply and breach the quarterly limit will miss out on FIT accreditation. On the flip side, there is also some 72 MW of hydro and solar (above 50 kW) capacity that is unallocated, albeit at the pretty low generation tariffs that are still available. The closure of the FIT can be seen as the end of an era. Regen’s focus turns to what BEIS is planning to do next to encourage the badly needed deployment of low carbon electricity generation. A reception to launch the new EWiRE paper titled “The role of women as drivers of change in the energy transition”, kindly hosted by Lord Robin Teverson and supported by TLT and EDF Energy. The paper brings together an inspiring collection of articles, produced by leading women, on the key role diversity will play in the success of the smart and renewable energy sector in transforming our energy system. We have an ambitious programme to support more women leading the transition to a clean, decentralised and flexible energy system. But we know we can’t do that alone. 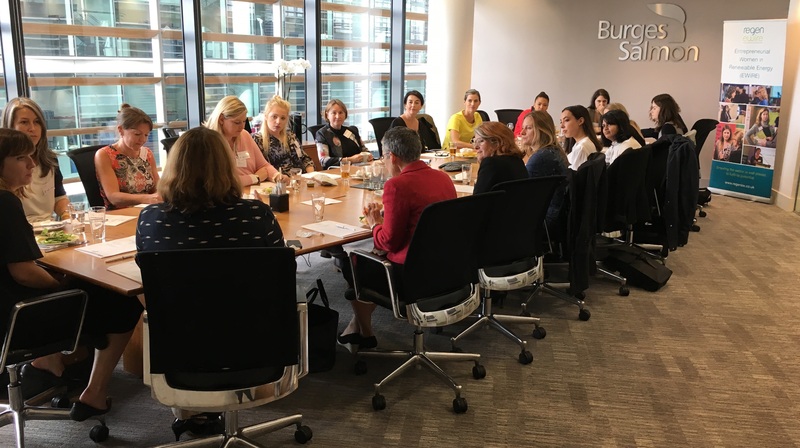 We are inviting leading businesses who are interested in seeing real change in diversity in our sector, to work with us by sponsoring EWiRE. Please see sponsorship of EWiRE details here. Hosted in partnership with Western Power Distribution, this event will hear from community energy groups, who have been through the trials and successes of recent projects, and sharing learning from their endeavours. We will be asking what’s next? What does the future hold for community energy and how can we make the most of the opportunities that are available to us? This event, hosted alongside Western Power Distribution, will provide a forum to continue the collaboration, learning and networking that is fundamental to community energy projects. We will look at the latest intelligence from projects happening on the ground and find out more about the changes in our energy system. This forum brings together organisations engaged in the electric vehicle revolution with those involved in the electricity system to discuss the challenges and opportunities from the growth of the electric vehicle market. This second forum will focus on smart charging and the work Regen has been doing on the opportunities with Vehicle to Grid technology. This forum will explore the opportunities of the digital transformation of the energy sector, with specific focus on data and how we can effectively use vital data assets to bring about the digital revolution. The forum features a case-study led agenda providing the necessary insight on how to implement these technologies to successfully innovate, drive efficiency, reduce cost and environmental impact. Regen’s solar and storage developer forum brings together leading players in the sector with key policy makers and regulators to discuss how to enable large scale solar to become a successful and sustainable sector playing a key role in the UK’s energy future and decarbonisation targets. The Electricity Storage Network is holding its annual symposium, bringing together the storage and renewable worlds to debate solutions to the most pressing challenges facing the industry and achieve the right societal and economic model to allow industries to flourish. Foot Anstey, Plymouth, 7 March - the workshop will discuss the issues around planning for smart new residential and commercial developments. Burges Salmon, London, 28 March - in the morning, prior to the EV and Electricity System Forum, we are convening a workshop to discuss planning issues around electric vehicle infrastructure. If you are interested in attending these workshops, please contact Emma on 01392 494399. 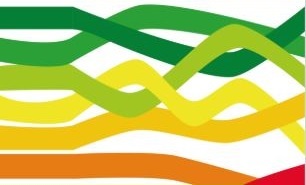 The project team are also gathering evidence on people’s experiences, ideas and case studies on how to plan positively for smart energy through an online questionnaire. Please click here to complete the survey. The survey closes on 8 March. Please contact Hazel to discuss the project further. We are also excited that Renewable Futures and the Green Energy Awards will be back this year on 27 November. This industry leading event will feature a line up of experts and key policy makers who will analyse the disruptive innovation shaking up the energy market and examine the strategies to adapt and create value in a rapidly changing market. If you are interested in getting involved again for 2019, email Hannah or ring the office on 01392 494399. If you are interested in hearing more insight and policy updates from Regen, or want to engage with our work further, take a look at our membership packages or contact Emma.